Of Suffolk's towns, Bury is third in size. But it can make a reasonably convincing claim to be the most significant. Ipswich and Lowestoft are away on the east coast, whereas Bury is central; Bury was, until 1974, the county town of West Suffolk. And, more than a thousand years ago, it became the main goal of travellers in all East Anglia. This was because of the martyrdom of the Saxon King Edmund by Viking invaders; his body was brought here to lie in state, and be buried. A great abbey grew up around the shrine, which became the third most popular site of pilgrimage in the country after Canterbury and Walsingham. The abbey had a chequered history, particularly in its relationship with the medieval town that grew up around it. Small wonder, then, that it suffered the full fury of the Reformation, being almost razed to the ground. Substantial ruins remain, as well as the two abbey churches of St Mary and St James (the latter now reinvented as the Anglican cathedral). Despite their location in a public park, the ruins are haunting, and you need to cross the county border to Ely or Peterborough to imagine what was here before. But Bury thrived during the 19th century, and industrial development led to the expansion of the town eastwards. This area is a delightful one now, with neat rows of red and white brick terraced houses clustering the gentle hills. 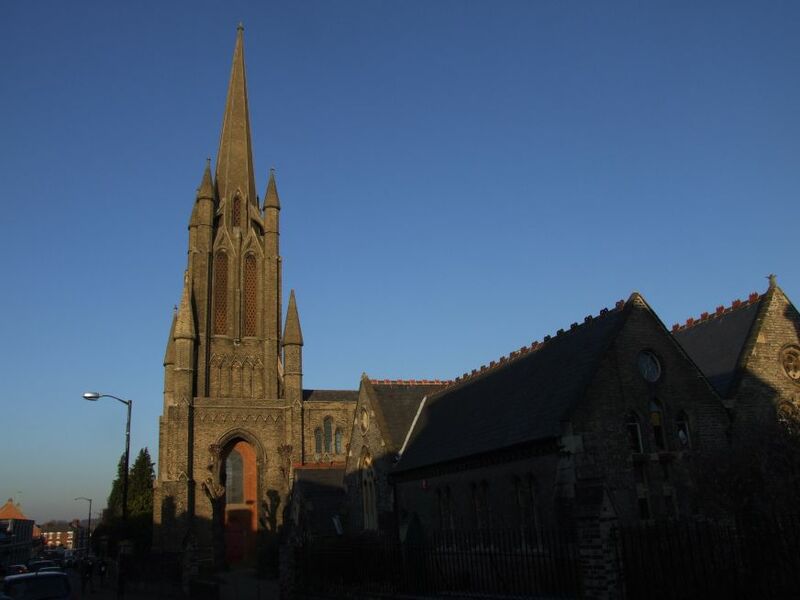 Sandwiched among them, among the shops, chapels and workshops, is William Ranger's mighty 1840 church of St John the Evangelist, one of the first great Victorian Gothic churches in England. Pevsner describes the spire as 'ignorant', which means that it was built in the days before the Camden Society and the Oxford Movement insisted on authentic medieval details. The style is, broadly speaking, Early English, but with curious Rhineland Castle frills. It is interesting to compare the church with the spireless Ipswich St Mary, built at almost exactly the same time, and in the same idiom. I'm told that there are people who refer to St John as Thunderbird One, which is more amusing than Pevsner, if no less snobbish. 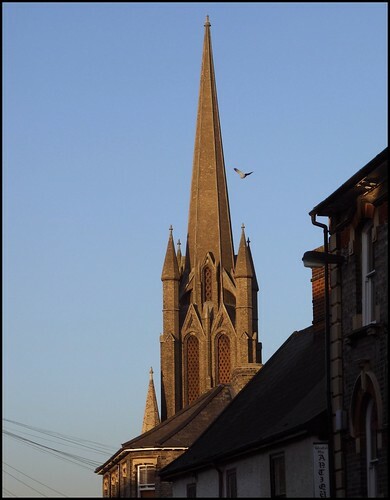 The great spire rises above St John's Street, its corner turrets throwing flying buttresses up to the octagonal tapering steeple. The church is built of Woolpit brick, which has weathered to a rather grim colour, giving the impression of old stone, without its patina. The nave and aisles set off eastwards in a confident fashion. The church is raised above street level in an interesting way, and it is possible to make a circumnavigation of it - but only just. The most striking feature from close up is probably the enormous western arch, imitating Cotton, but giving a vista from outside of what's happening at the altar. The low building to the south is the former school. The Diocese of Ely, which oversaw the project, also put a Vicarage among the collection of buildings, and this idea of a clerical 'village' can also be found elsewhere in the Diocese, at St Luke in Cambridge, for example. The whole project cost £6,000, about one and a half million in today's money. Rich local patrons, the Harveys of Ickworth, defrayed much of the costs. There was a time when many people were a bit bit sniffy about Victorian churches. But this is changing, and in any case this church is fascinating in many ways, not least as a document of the development of the Anglo-catholic movement within the Church of England, from its earliest beginnings, through its years of ascendancy and triumph, to its more recent trials and retreat. To read this document, step inside. You enter the great west doors, into the enormous space beneath the tower. This large porch is partitioned from the nave by modern glass, which looks very fine. Beyond, the eye is drawn irresistably eastwards beyond the font, to the great high altar, the colourful reredos beyond, and the figures of the Evangelists above. Its a bit like the one at Ipswich St Pancras, only more colourful. Further above, the clear glass around the 1850s medallions in the east windows floods the sanctuary with light, making this church far less gloomy than many Anglo-catholic churches. All around are devotional items; the image of Our Lady, with candles flickering in front, St Michael, a carving from Oberammagau, the reserved sacrament chapel, and so on. In fact, none of this is original. In 1841, when the church was built, it was intended as a preaching house, and was filled with high box pews. There was no central gangway; there was a block of benches up the middle, with a passageway on either side. Above the main entrance was a gallery. The church was known as Bury new church, and was not intended to reflect the teachings of the budding Tractarian movement, which at that time in Oxford was attempting to relocate the Church of England within the Catholic tradition. This would not bear fruit for several decades. No, this church was built to compete with the non-conformist chapels on their own terms. They were perceived as the greater threat. It was not until 1870 that the first Vicar of the church, the Rev. B. Rashdall, was replaced by a young and enthusiastic Anglo-catholic priest, Father Stewart Holland. The effect was somewhat akin to a whirlwind descending on the church. During the seven years of his incumbency, the church was completely transformed, to emerge as St John the Evangelist, the county's flagship Anglo-catholic shrine. The excellent church guide here contains notes from Father Holland's journal, and it is interesting to look at his progress a year at a time. In 1871 and 1872, the great pulpit was taken down, and replaced by a simple reading desk. The church was decorated for Easter and Christmas. The black gown was given up, and surplices were worn by priest and servers. Holy Communion was introduced on every Sunday, and pew rents were abolished. Services were introduced on weekdays, and some of them were sung. In 1873, choral Mass was introduced; the choir was surpliced, and a vestry built. The west gallery was demolished, and the arch opened out. In 1874, Father Holland introduced Mass on Saints' days, and the psalms were chanted. In 1875, the chancel was reordered to make it more sacramental, and tiled. There were now two curates. In 1876, the great reredos was fitted. All the box pews had now been removed, to be replaced by more fitting benches. The following year, the font was installed. Although the east window predated Father Holland's arrival, the church would still have been very light, but over the next twenty years or so, much of the coloured glass was added. The east window was further redeveloped in 1960, when clear glass replaced many of the dark Victorian panes. As the century turned, the pace of development slowed, but did not stop. In 1908, a Lady Chapel was fitted into the south aisle (it has been reordered since). By now, the Anglo-catholic movement was becoming the Anglican mainstream. The guidebook also contains a fascinating memoir by Canon Ullathorne, who was vicar here between 1942 and 1951. He remembers the two Masses every Sunday (three on the first Sunday of the month). Daily Mass was introduced, and the Blessed Sacrament reserved in the new chapel. He recalls the mission in 1949 by Anglican religious from the Convent at Ditchingham in Norfolk. Fascinating stuff. Today, the Parish continues its tradition, albeit on the Affirming Catholicism road rather than going Forward in Faith. The previous Archbishop of Canterbury, the low church Dr Carey, remarked that the state of the health of the Anglo-catholic movement is a mark of the health of the Church as a whole. I've taken this to mean that, if the Anglo-catholic movement continues to flourish despite its state of siege, then it will be rather a relief for those who allowed the siege guns so close in the first place. The Anglo-catholic tradition here, for obvious reasons, makes this a necessary church, in a way that it might not have been otherwise, given its proximity to the Anglican cathedral. This is a place where aesthetics matter, unashamedly so. The most recent addition to the church is a new set of Stations by the artist Ian McKillop, dedicated at the start of Lent 2008. They culminate in his graphic, visceral Risen Christ above the south aisle altar. An anecdote to finish with. When my children were younger, they attended a Catholic primary school in the middle of Ipswich; it was a school we liked a lot, not least because it had the air of a village school in the heart of a town. As all village schools should be, it was famous for its summer fete (those Catholics know how to run a beer tent!) and the fete included a crockery-smashing stall; for users of this site outside of the UK, I cannot even BEGIN to offer an explanation. One year, as my son queued up with his wooden balls, I spotted a bowl on the stall that had a picture of a church on it. By a rather hasty process of queue-jumping and negotiation with the stall-holder, I rescued it before it could be smashed. The picture was of St John the Evangelist, and the dish, dating probably from the 1850s, showed the church before the terraced houses grew up around it. Its aspect was quite different, and for the first time I began to see what Ranger was getting at. It looked spectacular in its isolation. This was a church intended to be seen from a distance; but today, this prospect can only be obtained from the nearby A14, as its dual-carriageway cuts through the north of the town. The traveller's sight of Bury's churches consists, not just of the former abbey and the new tower on the Anglican cathedral, but of St John's mighty 'ignorant' spire, Thunderbird One, lifting gloriously to heaven.